I know some of you will grumble at this post because it’s Christmas-related, but I just HAD to write about this year’s Ciate Advent Calendar. This cute gift, which is on sale NOW, is a total must-have for any beauty lover. Complete with 24 little Ciate treats, including its polishes, paint pots and nail transfers, you definitely won’t struggle for some nail inspo over the festive season! The calendar, which comes complete in a cute little manor house design, may be a little more pricey than an average advent calendar, at £49, However, that is a huge saving on what it would cost you if you bought all of the items separately. Beauty advent calendars are still quite new, with some retailers only introducing them last year. However, the ones who did sold out straight away so snap your Ciate one up before they all go! Everyone who has read my nail reviews on here before knows how much I love Barry M nail paints. In fact, I don’t even think I’ve reviewed any other brand yet! However, all my reviews previous have been for Barry M’s Gelly range, whereas I’ve decided to go back to the original paint. This wasn’t really a concious decision to be honest. The fact was that I was looking for a summery pastel shade & I don’t have all the Gelly colours yet as I already had lots of existing colours in the normal paint version & I didn’t want them to go to waste. Ideally I was thinking about a pale pink colour, however I stumbled across this shade & it grabbed my attention, so I decided to go ahead and use it. As you can see from the photo, it is a lilac shade, however has a pink undertone too. The colour does come out really nice & coincidentally matches in with the purple/pink colours on the top I am wearing today perfectly. 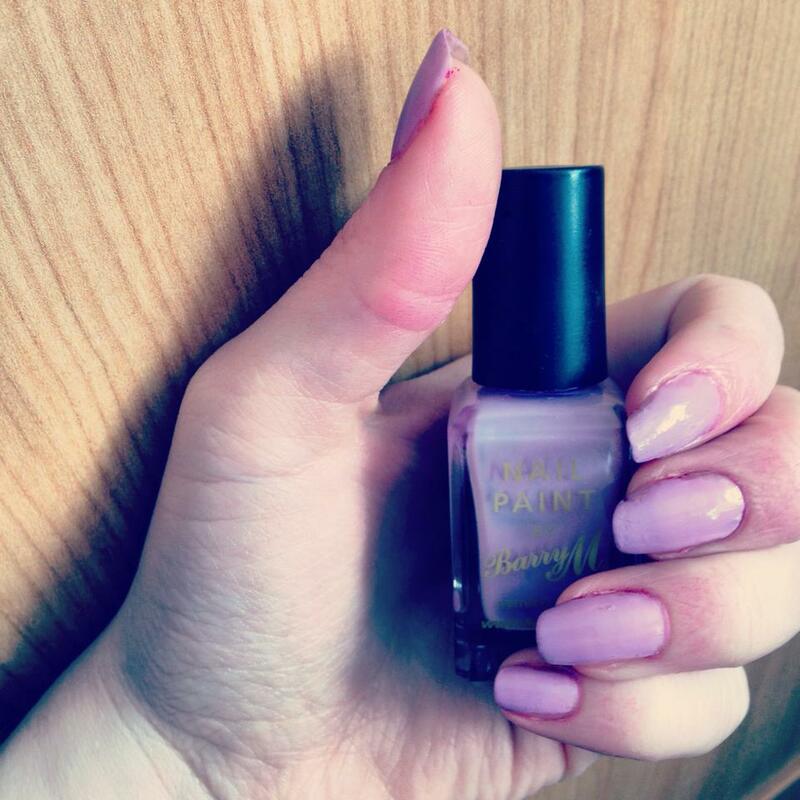 If you are looking for a definite lilac or pink shade however, instead of a combination, I would suggest either opting for the Barry M Gelly Nail Paint in ‘Lilac’ or in ‘Pink Lady’. The Gelly shades also need fewer coats and dry a lot quicker than the standard paint. I found that I needed several layers until the ‘Berry Ice Cream’ shade looked thickand did have to wait quite a while for it to dry. As I said however though, I am pleased with the end result, but would have preferred one of the Gelly shades if I’m honest. Maybe it’s time for me to clear out my nail drawer and start investing! What are your opinions on nail paint – do you use the standard versions or are you Gelly all the way now? Let me know below! As well as drying really quickly, they also give a thick, glossy coat that lasts more than five minutes. The only thing about the range is that there weren’t that many different colour to choose from at first. However, Barry M has totally pulled it out of the bag by introducing some new Gelly pastel shades for spring/summer! When I heard the news I was literally so excited to go to Superdrug and get some (sad, I know). 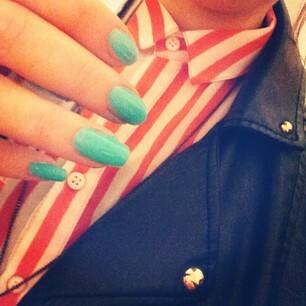 As you can see above, I opted for the ‘Huckleberry’ shade first, as I’m loving pastel blue nails at the moment. Once again, like the brighter shades that I have used in the range, the polish dried really quickly and with a great shine. You also get a nice thick colour after just a couple of coats, which is great. This shade looks great if you are wearing other pastel colours. For example, I wore it with a pink fluffy jumper. Now all I have to do is try both the other new shades – I can’t wait! Superdrug has a deal where you get two of the polishes for £6 at the moment, so make sure you take advantage of that. Normally the polishes are priced at £3.99 each – still a bargain for such a good product. Let me know what you think of the Gelly polishes or the new shades if you try them out! I decided I wanted to wear my orange and white striped shirt out to the pub on Sunday night & I wanted a nail colour that would stand out just as much. Barry M’s Gelly Effect in ‘Green Berry’ fit the bill perfectly. Not only is the shade gorgeously vibrant and full after just two shades, it also dries incredibly quickly, which is great, as I was in a rush to get out the door (as usual). I seriously recommend the nail varnishes from this Gelly range, as they are honestly the best for coverage and drying time I have tried for ages. I have also recently discovered that there are more colours than I though there were in the range too – but hopefully there will be even more soon. What’s more, they are only £3.99, which is a bit of a bargain anyway, but I hear they are 3 for 2 in Superdrug at the time of publishing – which is even better! Let me know if you have tried the Gelly range and what your favourite shade is. There is something uber-chic about white nails. They look sophisticated, perfectly understated and chic. They also go with any outfit too. As you can see in my main picture, I wore them with my basketball jersey top (which is from Primark if you were wondering). However, the next day, I wore a white blouse and black blazer and the nails still matched perfectly. This just shows how versatile the shade is. I’ve also had the most compliments in ages than I have about them – which is a nice added bonus. I used Barbara Daly ‘snow’ shade (available at Tesco) to achieve this look. 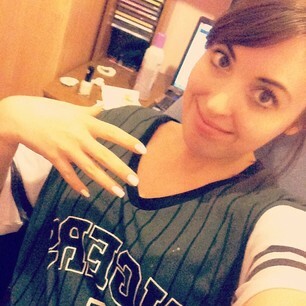 The only thing is that I bought this nail varnish absolutely ages ago – I mean years. I looked on the Tesco website & can’t see the product still on sale, however you never know, it may still be in-store. I can’t recommended the brand enough though. I managed to achieve a nice, glossy even colour after just two coats. It hardly chips either, but I would recommend putting on some topcoat just in case if you are planning to keep the shade for a while.